Illinois private colleges enjoy a very unique reputation for academic excellence, athletic achievements, and cultural diversity. Ever since its founding, Illinois has drawn different ethnic groups from all over the world. This multicultural background has allowed Illinois to absorb many different ways of thinking over the years. Thus, despite Illinois' being dubbed the "Prairie State", a city like Chicago can go head-to-head with metropolises such as New York, Los Angeles, and other coastal cities. Illinois private colleges and universities offer a wide range of education programs with degrees and certificates up to the doctoral level, as well as professional degrees such as law and medicine. There are 147 colleges in Illinois, 60 public and 86 private, offering a wide range of programs and majors. These Illinois private colleges are diverse in character, academic emphasis, and origins. Some private colleges or schools have a religious affiliation; others are secular. Private colleges and universities may be profit or non-profit institutions. Typically, Illinois independent colleges or private schools give weight to personal characteristics and activities in addition to considering GPA and test scores. 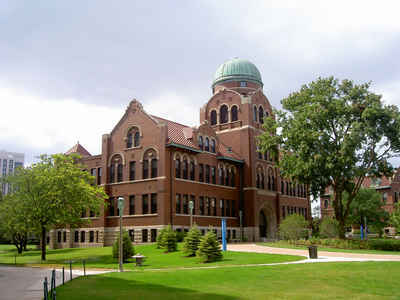 The largest being DePaul University with 19,029 full time students. University of Chicago is the most expensive with an in-state tuition of $43,581. On average, how much does it costs to attend private college in Illinois? The average annual in-state private college tuition in Illinois is $23,836 in 2013. The Federation is a statewide association representing the public policy interests of 57 independent Illinois (private, not-for-profit) colleges and universities and the students they serve. The Federation strives to enable the continued success of member institutions and their students through proactive government relations and public affairs efforts.